AFSers take pride in being changemakers and global citizens committed to improving the lives of others. This is no different for the members of the AFS Volunteers Association in Turkey (AFS Gonulluleri Dernegi, AFSGD) who recently started a new initiative called KArE to address local and global problems while advancing the AFS mission of intercultural understanding and peace. 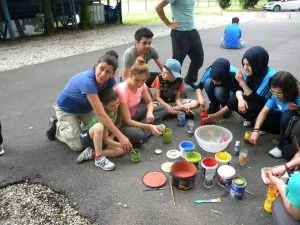 This new initiative evolved from a project in Hakkari, a province at the east of Turkey where a short exchange program was organized to Izmir, one of the biggest cities on the west coast of Turkey. Hakkari high-school students and Izmir host families and volunteers got to know each other better, and developed a cross-cultural understanding, affecting their families, neighbors and societies too. The impact of this exchange went far beyond the immediate exchange – today, Turkish volunteers are launching a new initiative aimed at expanding their reach. What is the role of intercultural learning and global citizenship in the KArE project? KArE is an acronym for Kulturlerarasi Etkilesim – Intercultural Interaction. It will be all about intercultural learning and global citizenship beyond cultural exchange programs. There are regional differences within countries, differences between neighborhoods in cities. Yet, there tends to be very little engagement with difference and people often don’t get to know each other. We have decided to say, enough with that! Bringing diverse people together is what AFSers are best at. Give us two different communities and we will help people collaborate and enjoy their differences – we will establish intercultural interaction. That’s what we know and what we have been doing for decades. Our strength is that we know very well how to deal with, accept and respect differences. And that is exactly what is missing in the world today. We believe that not doing anything with that strength is just not an option. What inspired you to start the KArE initiative? It’s a combination of several things, both positive and negative. We have been involved in different projects community service projects before, but the impact of our actions in Hakkari was a game-changer. The effects of this project and the positive reactions we got from around the world, including the AFS ChangeMaker Award, made us realize our power to change things for the better. The geographical position of Turkey and current state we are in was another trigger. Thousands of people come to seek refuge within our borders from our neighboring countries of Iraq and Syria every day. The distressing images of this refugee crisis, combined with the clashes within Turkey that claimed 500 lives within the last year, made it impossible for us not to react. Finally, the June 2013 Gezi Park protests are an important factor and an empowering moment for the youth of our country. That is when we realized that together we can create change. Our volunteers have long had an urge to do more, make a bigger impact on our society. Now, it’s our time to do that. This is how we see it: it’s not that wanting to do something is humane, but not doing anything is rather inhumane. Why do you think this initiative is needed and what can AFS volunteers do to address this need? Perhaps we are naïve, but we never imagined that in the 21st century, we would be surrounded with so much pain. But here we are, and we need to do better. AFS was born out of two world wars. Our founders are volunteer ambulance drivers who carried the wounded from battlefields. Their activities evolved into cultural exchange programs, enabling different people to get to know each other. Volunteers in Turkey have been yearning to revisit the AFS mission and find more ways to work on fostering intercultural understanding and peace. KArE is not only about doing more, but also about calling more people to our side. We will be opening KArE clubs in schools, communities, around the country and we will be calling all those who believe that we can make a significant contribution to peace through intercultural interaction to come and join us. What impact do you want to make by this initiative? Who will be affected by it and how? It’s simple, we want to change the world! That may not sound very realistic, but there’s no harm setting the goal as high as possible. Of course, we will go one step at a time. We will try to impact whomever we can, as many people as possible. Our focus will be on young people; they are the ones who will design the better world we want achieve. We will also target women, as they are the real changemakers of any society. Which projects do you already have planned and in the making? We have several projects in focus this year. Building on our actions in Hakkari is certainly one of them. We want to continue what we have started there and make it even bigger. We will have exchanges, youth camps, trainings for the students, teachers and women of the city. Another project we deeply care about is partnering up with an Armenian youth NGO, Youth Initiative Centre, to build a joint project team. This year, we will have two workshops to train volunteers who will later work on several projects a year to connect the youth of these two countries. We are already running workshops under the name “Discrimination Studio” in universities and different communities, focusing on discrimination of different minorities within the society. These workshops will spread in the next year. “Turkiye Kardesleri” is a project we co-developed with AFS Turkey (Turk Kultur Vakfi) which contains several short-term exchanges between cities from around the. We will continue developing that project this year. We are also seeking partnerships with other NGOs to tackle the refugee crisis and the first KArE clubs in high schools should be open this year. Our volunteers are quickly coming up with new project ideas, to create an impact beyond our local communities. Globalization has made the world problems our own and we are ready to tackle them head on. We invite everyone to join us! For more information, and to find out how you can get involved in the KArE initiative, contact AFSGD at [email protected] or www.facebook.com/afsgd.